Detail King offers Buffing Pad Cleaner and the necessary supplies needed to professionally clean rotary buffing pads. Easily use Pad Renewing Solution along with a buffing pad professional cleaning tool, to restore your dirty and worn polishing pads to new. Also, if you are looking for a more efficient way to clean your pads in bulk, we suggest using the Grit Guard Universal Pad Washer. This pad washer will provide you with an unbeatable pad cleaning experience, while making your pads cleaner then new. This pad washer can also come equipped with a detailing cart, for maximum convenience. Keep your wool buffing pads clean while buffing. 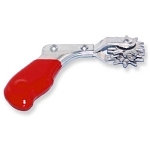 This is a commercial grade buffing spur that will effectively clean all wool buffing pads. Has a pistol grip with rotating spurs, OSHA Safe.